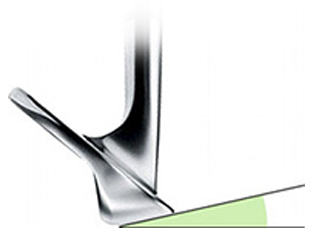 Bounce determines the ease with which your club head is going to bite into the ground. A low bounce angle makes it easier for the leading edge to dig into the ground. This is a benefit when playing in dry conditions or compacted sand. 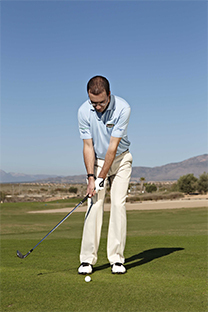 A higher bounce angle lifts the leading edge higher up off the ground, making it less likely to dig in. This is useful in soft grass or fluffy sand. For those golfers in the south-east, a higher bounce is recommended. Next time you watch golf on TV, watch how many times the leaders get it up and down for two from a chip shot. In fact, with the best, watch how they are actually trying to chip it in! When I am coaching, a common problem among students is digging the leading edge of Wedges into the deck and hitting the ball thin. The answer is to work on swing consistency, connecting the ball with a downward stroke. Remember, hands will be marginally ahead of the ball at contact, so perfecting this element of the stroke is one of the keys. A recurring gripe among better players is a tendency to snag the Wedge’s leading edge on the grass because the hands are too far forward. The reason is the reduced margin for error this technique creates. It can result in deep divots and often means the ball flight is not as high as intended. Higher handicappers are more likely to try and “scoop” the ball up, meaning the hands are often trailing behind the ball. We have all been there. This tendency alters the effective bounce of the Iron and sacrifices consistency and control. Matching a better technique to the right bounce can help with “snagging” and “scooping”. This entry was posted in golf and tagged chipping, golf, golf game, golf instruction, golf tips, short game, slice. Bookmark the permalink.